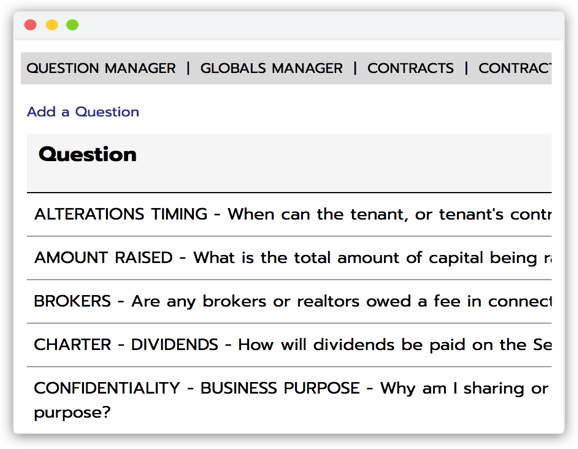 Build your own templates using our massive library of legal issue spotting questions and clauses or by assembling your own — so simple you can do it yourself without paying for configuration. Break out of the email attachments morass and get to work on the same version. We let you share any version you choose to draft collaboratively. Negotiate away with as many versions as you want to close your deal. Compare any two versions online and see all additions underlined and deletions struck through. No Legal Advice. WhichDraft.com does not provide any legal advice or legal conclusions. We do not provide any documents, contracts or other information based on your unique circumstances or interests. We only offer general contract language that can be used by our users to create documents and contracts. As a result, WhichDraft.com is a self directed legal resource providing a library of information that can be customized by a user to meet that user's unique circumstances and interests. WhichDraft.com does not review whether your customized documents and contracts, revisions or uploaded documents (if any) meet your concerns. If you want assurance that any of the foregoing meet your concerns, WhichDraft.com recommends you consult a licensed attorney in your area. Not a Law Firm/Legal Services Provider. WhichDraft.com is not a law firm or legal services provider. Our employees and web site do not function as your attorney. We do not practice law, nor do we provide legal advice. WhichDraft.com in no way is a substitute for an attorney. Your legal issues are personal to you, and WhichDraft.com does not present itself as meeting your individual needs, which may require you to consult with a licensed attorney in your area. No Attorney-Client Relationship. Because we do not provide legal advice and we are not providing legal services, using WhichDraft.com does not create an attorney client relationship with you. In fact, only you or your attorney represents your legal interests when using WhichDraft.com. No Guarantee. 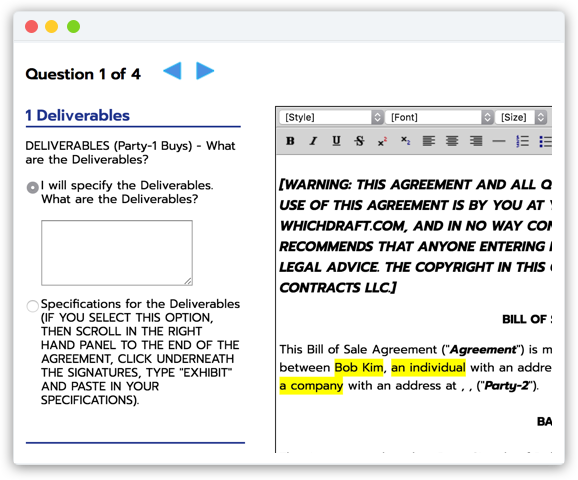 The documents, contracts and information appearing on WhichDraft.com are not guaranteed to be enforceable, accurate, current, correct or complete.